Inspired by Jonathan LaCour's January post about tracking his podcast listening habits, I recently decided to bring in my own listening history into my website. Like Jonathan, I use Overcast to listen to podcasts on my phone, and I was surprised and delighted to learn that Overcast has an "All data" export option on the accounts page that includes per-episode details such as whether you listened to an ep, and when you last interacted with it! I took a look at Jonathan's script to automatically log in and import his Overcast data and figured I could make something a little more minimal that would work with my Hugo site. My process follows three steps: download the overcast.opml full export file, run a script to generate the Hugo posts, and run a script to grab extra podcast metadata like cover art. You can find my scripts in this gist if you're interested in learning more, but they may not be that useful for anyone without my exact Hugo config. You may notice in the scripts that I have a "block list" of podcast URLs I can add. That's because I wanted my listen posts to helpfully link to and embed audio whenever possible. However, some of the feeds I subscribe to contain private or for-pay content - particularly a couple of podcasts I support on Patreon. I do want to track my listening habits for these podcasts, so I will likely start handling them differently by leaving out the embedded audio and linking directly to Patreon pages where possible. Running the script, I was able to happily show everything I listened to as just another type of post on my site. However, it turns out I had (and keep making) a lot of listen posts. Visually they were drowning out all my other activity on my site. So I have sequestered them on a new Listens page where you can only follow my podcast consumption history, keeping it out of my main feeds. Similarly, I have been interested in having a nice Instagram-like page that shows off my photos in a grid. So I made a Photos page to show off those posts. Both of these pages have microformats2 feed information embedded, so if you have an Indie reader, you might be interested in following just those pages! I had a bit of time this weekend to tinker with my site. 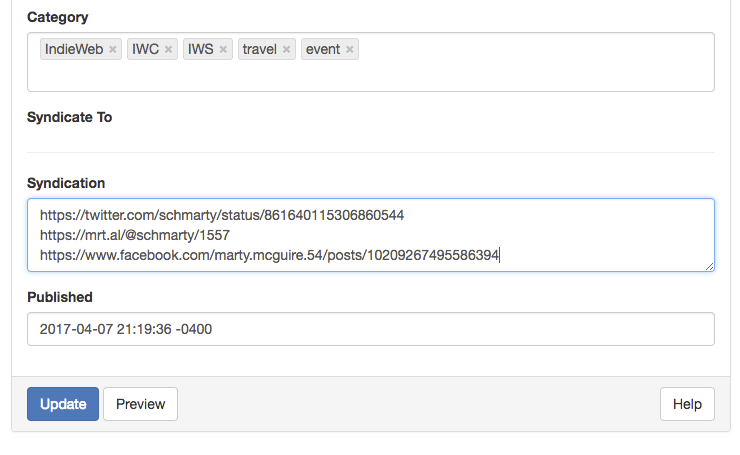 The biggest change is one that happens totally behind the scenes - I've added a step to the service that compiles and deploys my site to automatically send Webmentions from my posts to posts that I am responding to or mentioning. There are many folks with projects around this, but they tend to be a little more aggressive than I like in finding URLs to send mentions to. For example, they often want to send mentions to my homepage and avatar image for my own posts! So, I have added a Webmention sender to my site that is triggered by new and updated pages and sends mentions to any URLs that I am specifically responding to or person tagging, along with any URLs mentioned in the actual content of the post. Along with this, I now support person tags on regular entries like this one. I can add a tag like http://tantek.com to a post and it will tag them with proper markup and, if possible, show the name and photo from their homepage h-card. Finally, I did a little cleanup in how I display reply contexts for other people's posts that have multiple images in them, like this one from Aaron Parecki. It's nice to be able to sit down and knock off the little nagging TODOs here on the site. That said, I'm hoping to be able to make some big changes, soon! We'll see what my schedule allows. This is a write-up of my Sunday hack day project from IndieWebCamp NYC 2017! You can see my portion of the IWC NYC demos here. Feel free to skip this intro if you are just here for the HTML how-to! 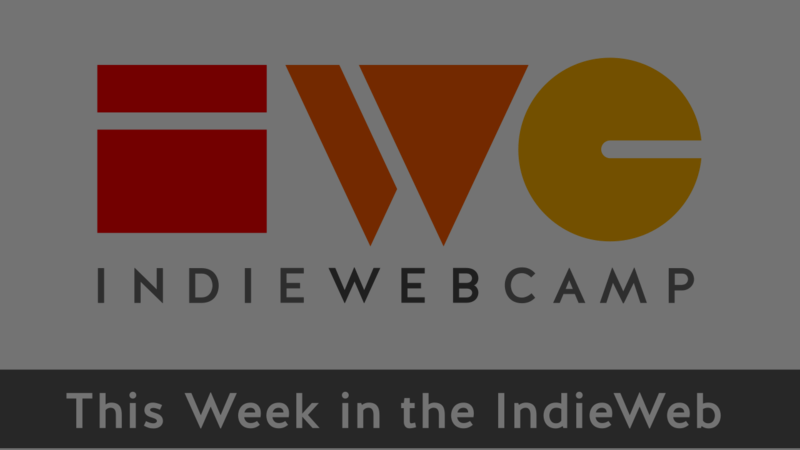 I've been doing a short ~10 minute podcast about the IndieWeb community since February, an audio edition of the This Week in the IndieWeb weekly newsletter cleverly titled This Week in the IndieWeb Audio Edition. After the 2017 IndieWeb Summit, each episode of the podcast also featured a brief ~1 minute interview with one of the participants there. As a way of highlighting these interviews outside the podcast itself, I became interested in the idea of "audiograms" – videos that are primarily audio content for sharing on platforms like Twitter and Facebook. I wrote up my first steps into audiograms using WNYC's audiogram generator. While these audiograms were able to show visually interesting dynamic elements like waveforms or graphic equalizer data, I thought it would be more interesting to include subtitles from the interviews in the videos. I learned that Facebook supports captions in a common format called SRT. However, Twitter's video offerings have no support for captions. Thankfully, I discovered the BBC's open source fork of audiogram, which supports subtitles and captioning, including the ability to "bake in" subtitles by encoding the words directly into the video frames. It also relies heavily on BBC web infrastructure, and required quite a bit of hacking up to work with what I had available. The BBC Audiogram captioning interface. Export the audio of the ~1 minute interview to an mp3. 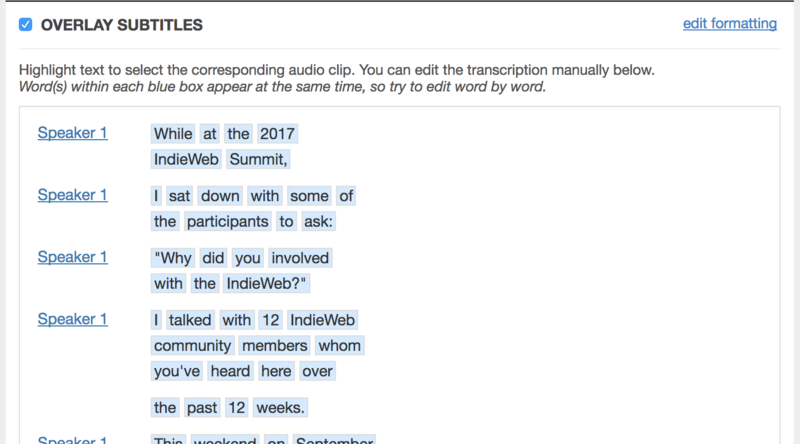 Type up a text transcript of the audio. Using VLC's playback controls and turning the speed down to 0.33 made this pretty easy. Use a "forced alignment" tool called gentle to create a big JSON data file containing all the utterances and their timestamps. Use the jq command line tool to munge that JSON data into a format that my hacked-up version of the BBC audiogram generator can understand. Use the BBC audiogram generator to edit the timings and word groupings for the subtitles and generate the final video. Bonus: the BBC audiogram generator can output subtitles in SRT format - but if I've already "baked them in" this feels redundant. You can see an early example here. I liked these posts and found them easy to post to my site as well as Facebook, Twitter, Mastodon, etc. Over time I evolved them a bit to include more info about the interviewee. Here's a later example. One thing that has stuck with me is the idea that Facebook could be displaying these subtitles, if only I was exporting them in the SRT format. Additionally, I had done some research into subtitles for HTML5 video with WebVTT and the <track> element and wondered if it could work for audio content with some "tricks". Let's skip to the end and see what we're talking about. I wanted to make a version of my podcast where the entire ~10 minutes could be listened to along with timed subtitles, without creating a 10-minute long video. And I did! How does it work? Well, browsers aren't actually too picky about the data types of the <source> elements inside. You can absolutely give them an audio source. Add in a poster attribute to the <video> element, and you can give the appearance of a "real" video. And finally, add in the <source> element with your subtitle track and you are good to go. Use the <track> element for your captions/subtitles/etc. But is that the whole story? Sadly, no. In some ways, This Week in the IndieWeb Audio Edition is perfectly suited for automated captioning. In order to keep it short, I spend a good amount of time summarizing the newsletter into a concise script, which I read almost verbatim. I typically end up including the transcript when I post the podcast, hidden inside a <details> element. This script can be fed into gentle, along with the audio, to find all the alignments - but then I have a bunch of JSON data that is not particularly useful to the browser or even Facebook's player. Thankfully, as I mentioned above, the BBC audiogram generator can output a Facebook-flavored SRT file, and that is pretty close. Yep. When stripped down to the minimum, the only real differences in these formats is the time format. Decimals delimit subsecond time offsets (instead of commas), and three digits of precision instead of two. Ha! If you've been following the podcast, you may have noticed that I have not started doing this for every episode. The primary reason is that the BBC audiogram tool becomes verrrrry sluggish when working with a 10-minute long transcript. Editing the timings for my test post took the better part of an hour before I had an SRT file I was happy with. I think I could streamline the process by editing the existing text transcript into "caption-sized" chunks, and write a bit of code that will use the pre-chunked text file and the word-timings from gentle to directly create SRT and WebVTT files. Additionally, I'd like to make these tools more widely available to other folks. My current workflow to get gentle's output into the BBC audiogram tool is an ugly hack, but I believe I could make it as "easy" as making sure that gentle is running in the background when you run the audiogram generator. Beyond the technical aspects, I am excited about this as a way to add extra visual interest to, and potentially increase listener comprehension for, these short audio posts. There are folks doing lots of interesting things with audio, such as the folks at Gretta, who are doing "live transcripts" with a sort of dual navigation mode where you can click on a paragraph to jump the audio around and click on the audio timeline and the transcript highlights the right spot. Here's an example of what I mean. I don't know what I'll end up doing with this next, but I'm interested in feedback! Let me know what you think! Jonathan Prozzi and I have challenged one another to make a post about improving our websites once a week. This is me getting back on the train! In a previous site update I wrote about setting up a system to notify me whenever my site received webmentions. Essentially, this meant that I could now get notifications on my phone and desktop whenever somebody interacted with my site, such as: replying to one of my posts on their own site, retweeting or favoriting one of my posts, or even RSVPs to my Facebook events. One thing I didn't super like about this system is that it used the Pushbullet service which, while great, is not under my control. I've been running a Matrix chat server at home for a while now. I primarily use it to chat with people in my household in IRC channels. I use a really nice client for Matrix called Riot, which runs in the browser, but is also available on Android and iOS, and is capable of sending notifications about chat events, which I have found really handy. Recently, I've added a chatbot to my Matrix server named Hubot, thanks to the Hubot-Matrix adapter. Hubot is super neat because it is fairly easy to script up new behaviors, and it has nice built-in support for the web - both for making web requests, but Hubot also runs a server for accepting web requests. Once I realized this, it occurred to me that I could replace my previous notification system that uses Pushbullet with one that goes through Hubot. I run Hubot behind a firewall, so no plain HTTP traffic can come directly across the internet. Using another home server, I set up nginx to act as a secure HTTPS proxy, using a certificate from Let's Encrypt to encrypt all traffic that goes over the internet. I decided that any behaviors I write for Hubot that use the HTTP listener will use some kind of secret token to ensure that the request is valid. I don't want spammers blowing up my chatrooms! 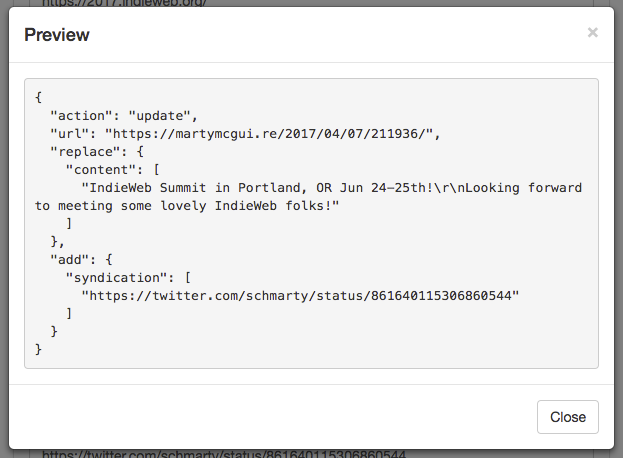 Allow a user to request webmention.io notifications for a given site into any room. Generate and store a "callback secret" to work with webmention.io's Web Hook system and tell the user the URL and callback secret to configure over on the Webmention.io Dashboard. Send the notification to the room that the user was in when they made the follow request. With that in mind, I began learning lots about testing Hubot scripts, refreshing myself on Coffeescript, and so on. I am now happy to introduce this first (janky) release of my Hubot Script, hubot-webmentionio-notify! The string "mycoolsite.biz" can actually be anything and should be something easy to remember in case you want to unfollow notifications later. Hubot doesn't check incoming mentions against it at the moment. You can enter the URL and callback secret in the Webmention.io dashboard, and future webmentions will be sent to your Hubot and output into the room of your choice. Notification example - a user on Twitter mentioned my Twitter handle in a post there. I don't know how useful hubot-webmentionio-notify will be for other folks at the moment, but I am excited be getting these notifications via services that I control. I look forward to building more fun things with Hubot! Jonathan Prozzi and I have challenged one another to make a post about improving our websites once a week. Here’s mine! In February 2011 I participated in the Thing-a-Day project on Posterous. It was the first time in a long time that I had published consistently, so when it was announced that Posterous was going away, I worked hard to grab my content and stored it somewhere. Eventually it was November 2013, Wordpress was “out”, static site generators were “in”, and I wanted to give Octopress a try. I used Octopress’ tools to import all my Wordpress content into Octopress, forgot about adding back the Disqus comments, and posted it all back online. In February 2014, I decided to resurrect my Posterous content, so I created posts for it and got everything looking nice enough. In 2015 I learned about the IndieWeb, and decided it was time for a new approach to my identity and content online. I set up a new site at https://martymcgui.re/ based on Jekyll (hey! static sites are still “in”!) and got to work adding IndieWeb features. Well, today I decided to get some of that old content off my other domain and into my official one. Thankfully, with Octopress being based on Jekyll, it was mostly just a matter of copying over the files in the _posts/ folder. A few tweaks to a few posts to make up for newer parsing in Jekyll, my somewhat odd URL structure, etc., and I was good to go! All of my Wordpress posts had this dsq_thread_id value, and that got me thinking. Could I export the old Disqus comment data and find a way to display it on my site? (Spoiler alert: yes I could). You can request a compressed XML file containing all of your comment data, organized hierarchically into “category” (which I think can be configured per-site), “thread” (individual pages), and “post” (the actual comments), and includes info such as author name and email, the date it was created, the comment message with some whitelisted HTML for formatting and links, whether the comment was identified as spam or has been deleted, etc. The XML format was making me queasy, and Jekyll data files often come in YAML format for editability, so I did the laziest XML to YAML transform possible, thanks to some Ruby and this StackOverflow post. I dropped this into my Jekyll site as _data/disqus.yml, and … that’s it! I could now access the content from my templates in site.data.disqus. I wrote a short template snippet that, if the post has a “meta” property with a “dsq_thread_id”, to look in site.data.disqus.disqus.post and collect all Disqus comments where “thread.dsq:id” was the same as the “dsq_thread_id” for the post. If there are comments there, they’re displayed in a “Comments” section on the page. 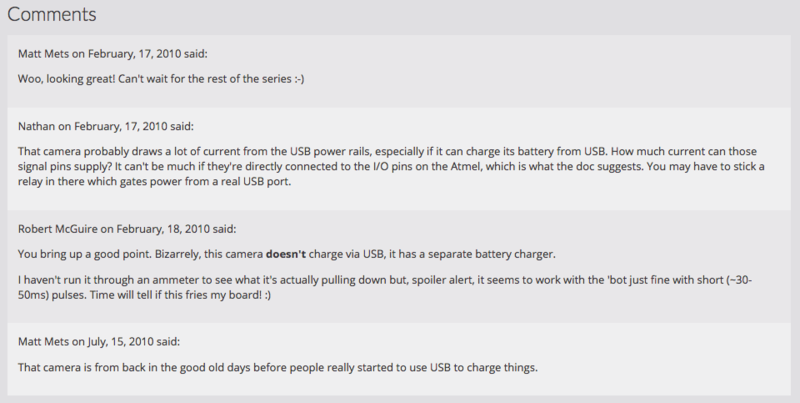 So now some of my oldest posts have some of their discussion back after more than 7 years! 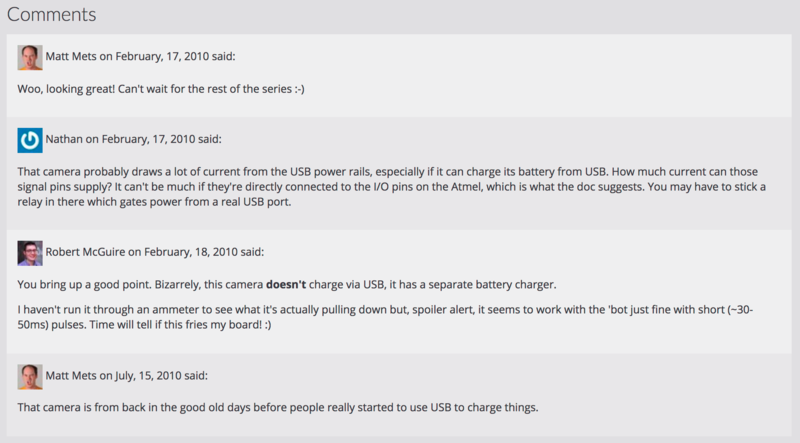 Example of old Disqus comments on display. I was (pleasantly) surprised to be able to recover and consolidate this older content. Thanks to past me for keeping good backups, and to Disqus for still being around and offering a comprehensive export. As a bonus, since all of the comments include the commenter’s email address, I could give them avatars with Gravatar, and (though they have no URL to link to) they would almost look right at home alongside the more modern mentions I display on my site. Inspired by Eddie Hinkle's recent post about viewing webmentions, I decided to improve the way I display webmentions on my site. TL;DR, my site now pulls attempts to recognize single-emoji comments and display them as a "Reaction". Slightly longer version - my site uses webmention.io for handling webmentions, and I use brid.gy to backfeed interactions from Facebook to my own site. The way brid.gy handles Facebook reactions other than the standard "like" is a little quirky - they show up in webmention.io as a "reply" with a single emoji as the "content". Using the Ruby twemoji library, my site checks the "content" of a reply against the emoji index and, if the content is a single emoji, pulls it out of the usual "reply" display and puts it in a facepile. The emoji itself is shown as an icon in the corner of the little face image. While I was at it, I cleaned up a lot of my webmention-handling template to make things much clearer. This will make things easier for folks that want to re-use this code when I (eventually) release this as a Jekyll plugin. Tonight is a Homebrew Website Club night, but Baltimore is not having another official meetup until April 19th. Still, I wanted to get something done to continue my deal with Jonathan to post something IndieWeb related at least once per week. Jonathan Prozzi and I have challenged one another to make a post about improving our websites once a week. I’m a little late with this one! 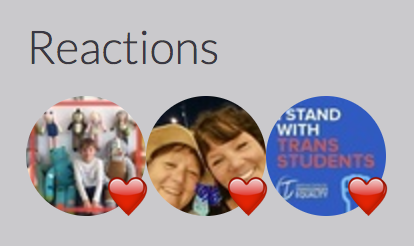 I recently added support for displaying mentions, such as likes, reposts, comments, etc. from around the web that refer to the posts on my site. One thing the update didn’t do is catch another type of mention, such as when someone mentions me in a tweet (example). These get fed to my website by brid.gy, but weren’t displayed anywhere. So, I created a /mentions page for displaying these mentions. In the future, when a post mentions my homepage, the result will show up on the mentions page. My mentions still don’t yet update in real time - they are compiled into my site whenever I make a new post. That’s coming up in the future, but I have taken one more step towards real-time interactions with notifications! Webmention.io, the service that I use for accepting and storing webmentions, has a WebHook option that can notify your site whenever a new webmention has been received. I wrote up a simple Python service using Flask that will listen for these messages from webmention.io and send them to me via PushBullet, a notification service that I’ve been using for a while for other projects. Now, I’ll see a notification on my phone and laptop when another site sends me a webmention! Update: Here’s an example notification! 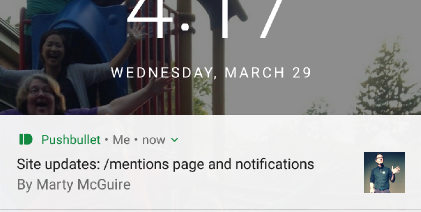 PushBullet notification that I have received a new mention.